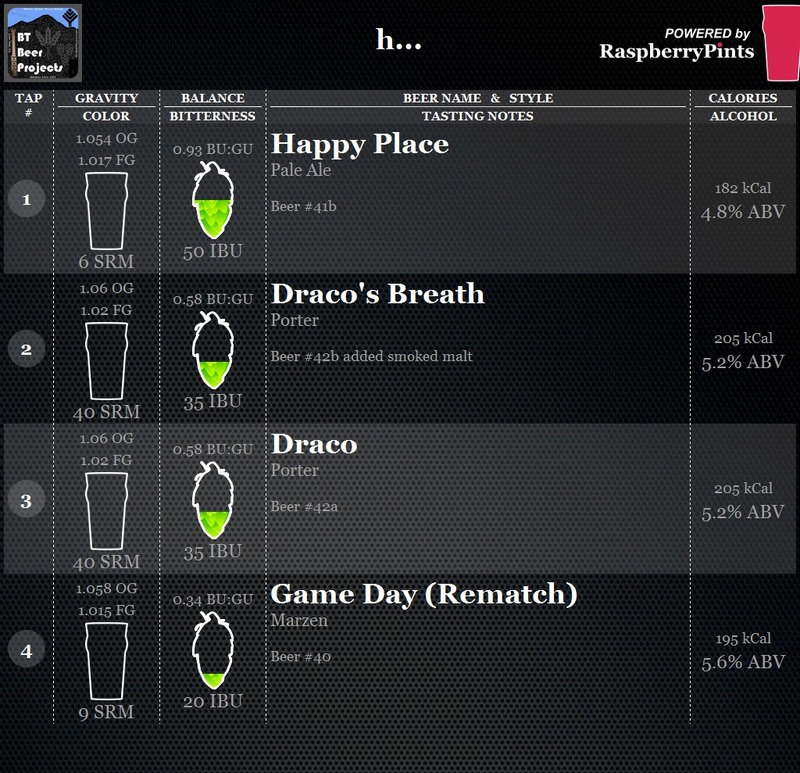 In playing around with the Raspberry Pi and Craftbeerpi, I came across a project called Raspberry Pints. This project is intended to enable a single screen behind a bar show what is on tap. It has fancy features to monitor the kegs if you add flowmeters and stuff. Somewhere along the way I read that someone noticed that this can be ‘ported’ to work on a normal apache/php/mysql server. So I thought, I have one of those (the website that you are reading) and decided to give it a whirl. Turns out the project is kind of dead or at least stalled for a while, but I managed to learn that the 2.0.1 zip file was a good start. I kicked off the install and ta-da it said everything was a success. So I went to the main page and immediately ran into several errors. Error 1: I think the install script running on my server didn’t update config files for the username and passwords that I was asked for in the install script. There are a few files this had to be updated. Error 2: The main page didn’t recognize some variables setup in a few include files. I’m pretty not php savy, but it seemed that if I setup a variable as a global things went fine. Error 3: Some of the includes were missing from the admin page to get into the mysql database. Simple adding the inlcude files to the files that generated errors seemed to overcome this. Once I was past that I was in and able to set things up. Quickly I discovered that I need to learn how to use this better. It seemed like some pages were overwriting information about beers when I didn’t think they should and subsequently mixed up the data on the beers. After a bit of trial and error I was able to get my info added. I then made a few updates. I wanted a way to jump back to my wordpress site added to the display. The logo on the top left normally takes you to the admin page, but I changed this to go back to my own page. This took some effort as I didn’t realize how the project was converting the mysql data into php variables. Several hours later I discovered an include file was doing this magic. Simply adding my new variables to this and adding the data to the mysql database got this all going. I tried to make an Admin link right below the logo, but my random attempts to update the php and css files failed. So instead I setup and Admin link on the left header in a ugly way. So there we go I have my digital taplist up and going. Now I can get back to my brewstand controller design, but at some point I need to create my own logo. 5/10/2018 Update: I figured out how to add some PHP code that will convert a snapshot of my current raspberry pints webpage to an image using khtmltoimage and add it to this post and my homepage rather than using iframe. This allows the image to size correctly in my post.